Vitamin and Minerals: (Calcium Phosphate, Magnesium Oxide, Sodium Ascorbate, Niacinamide, Ferric Orthophosphate, Zinc Gluconate, Calcium Pantothenate, Ascorbic Acid, Vitamin A Palmitate, Pyridoxine Hydrochloride, Manganese Gluconate, Thiamine Mononitrate, Riboflavin, Ergocalciferol, Folic Acid, Biotin, Potassium Iodide, Chromium Chloride, Phytonadione, Alpha Tocopherol Acetate, Disodium Phosphate, Silicon, Cyanocobalamin). Combine 2 scoops with 8oz of cold water or milk (dairy or plant-based) & mix thoroughly. 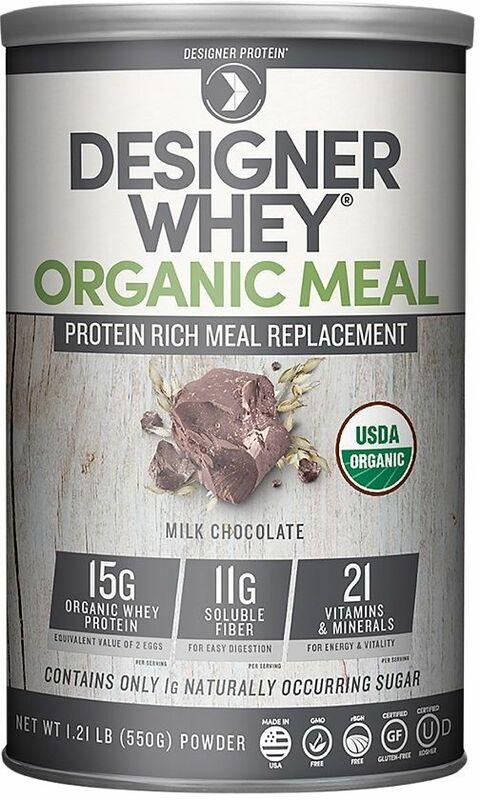 Do not use in diets supplying less than 400 calories per day without medical supervision. This product is packed by weight and not volume. 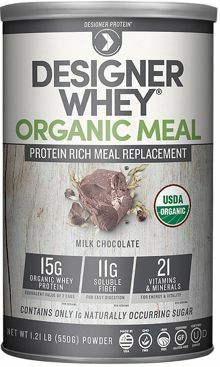 Designer Whey Organic Meal is a great solution for anyone looking for a satisfying meal replacement that is quick and easy to make. br>Protein-rich and packed with high-fiber natural ingredients to help you feel full, reduce blood sugar spikes, and keep hunger away.